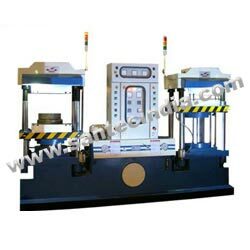 The power pack unit of these hydraulic compression moulding presses is assembled with high quality valves & other components. This ensures noiseless operations of these machines. The presses are designed as per BIS guidelines. Only standard seals and bronze bushes with lubrication arrangement are used in heavy duty cylinders. The precisely honed seamless tubes made of carbon steel are assembled with hard chrome plated piston rod. Sealing elements conform to EN-9 standard and are imported from Korea & Japan. Manifold block mounted valves minimize piping, which ultimately ensure no leakage. It further assists in the easy replacement of parts and comfortable maintenance. With the help of PLC, several functions can be controlled to desired specifics. For example, number of breathings, duration for breathing, curing time, temperature of platens, temperature variation range, pressure etc. may be programmed through PLC. If pressure drops below certain value during the curing period, the electric motor stop automatically. This ensures less strain to the hydraulic system, which ultimately saves electricity. While ensuring the safety of the moulded parts, smooth opening of moulds occurs right after the curing period. Ultrasonically tested plates of heavy thickness are used to make the frame. This provides rigidity and capability for frequent and fast operations. All platens have superior accuracy, as they are precisely grinded up to 0.01 to 0.02 mm parallel accuracy. The platens have T-slots and tapped holes with provision of heating & cooling as per DIN standards. Precise machining of the structural members is done to achieve parallel position between platen & bed and exact perpendicular position between moving platen and bed.